Currently no concerts planned. News will be published here! 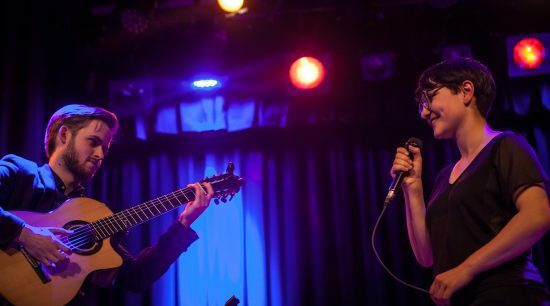 From grooving virtuosity to sensitive ballads, the singer Anna-Lucia Rupp and acoustic guitarist Sönke Meinen touch the hearts of their audience with an astoundingly varied repertoire – purely and simply with just one voice and one guitar. In her very distinctive vocal interpretations, Anna-Lucia Rupp combines the mellow sound of jazz with imaginative melodies and self-penned emotive lyrics. Sönke Meinen merges groovy fingerpicking with elements from classical music, jazz and folk to create a uniquely compelling and dynamic guitar style. He is prize-winner of numerous international competitions, recent examples being „Guitar Masters 2016“ and the „European Guitar Award“. In addition to his concerts with Anna-Lucia , Sönke tours solo, with jazz guitarist Philipp Wiechert or with violin virtuoso Bjarke Falgren. Anna-Lucia also shares the stage regularly with her bands „Mozaik“ and „Nouk“ as well as in duo concerts with guitarist Lukas Häfner or pianist Adrian Zendeh. Energetic, personal and graceful – a duo which takes you on a journey through captivating and enthralling soundscapes – goosebumps guaranteed!